Cette excursion hantée dans la Nouvelle-Orléans vous emmène à la découverte des fantômes et vampires les plus célèbres de l'effrayante histoire de la Nouvelle-Orléans, de la culture populaire et de l'architecture, des cimetières et, bien entendu, des récits des grands mystères non résolus de la ville. Populaire auprès des familles comme des personnes seules, l'excursion inclut une promenade dans le quartier français agrémentée de commentaires amusants. Comme le dit l'expression cajun « laissz les bon temps rouler » va, appréciez le moment présent ! Our tour guide Cody was Great! A lot of amazing stories of the city and they will stay with us!!! Helpful and really connected with the group! Thank you so much! Definitely a tour/vacation to remember!! Our tour guide Ashley was great! 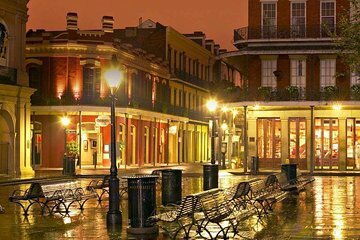 I have been to Nola many times and never knew about all of the haunted places! She was very knowledgeable on the history of the area and made it really fun! I would recommend this tour to everyone! The tour was a blast and the main reason was due to our guide Ashley. She was phenomenal! Knowledgeable, friendly, funny, and really seemed to enjoy what she was doing. The history in New Orleans is fascinating and she made sure to let us know about everything she had time to...we could have followed her around for another couple of hours it was so much fun!! Fantastic tour, fascinating and quite spooky. I'm so glad I attended as there is so much to learn about the history and tales (that could be true) of New Orleans. Corey was fabulous, he really added to the ambience of the tour with his mysterious manner, not your typical tour guide. Ashley tour guide was great! She made this night spooky and fun! Interesting and small intimate tour with well informed and energetic tour guide. Highly recommend. Our tour guide was amazing - very personable and friendly, told amazing stories and we all had such a good time laughing and getting history and current stories. She's a keeper! !